New to the industry, actress Sara Ali Khan‘s excitement to take everything in a stride is contagious as is visible from her recent trip to SoHo, New York, where she currently is for an advertisement shoot. 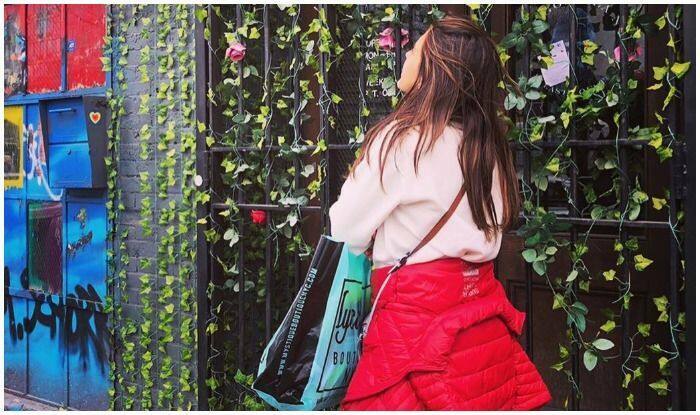 Reliving her college days in the city, Sara’s excitement to re-explore the place looked invincible as evident from the post that she recently shared on her Instagram handle. In the shared picture, Sara can be seen donning a light pink sweatshirt, teamed with black tracks and boots. Looking ahead with her back to the camera, Sara had a red jacket tied around her waist and a sling strapped across her shoulder. Standing next to roses hanging like climbers from a gate, Sara looked ethereal standing before a wall smeared with red, orange, yellow and blue hues. She captioned the vibrant picture as, “Just wandering in the city of dreams. Thank you @bookingcom for this exciting escape. Can’t wait to re-explore nyc! #ad #bookingyeah #sohonyc #nostalgia #memories” (sic).